PSUs had been less efficient in the deployment of their working capital last year compared to the year before. Though the working capital of PSUs increased during the last two years, their working capital turnover ratiowhich measures how effectively the money is used to generate salesdecreased. The working capital of a sample of 57 PSUs (excluding banks and NBFCs) increased by 1.7% to Rs 1.74 lakh crore during 08-09 and further by 11.1% to Rs 1.92 lakh crore during 09-10. But the working capital turnover ratio of these PSUs fell to 4.91 in 09-10 from 5.8 during 08-09. This indicates that the depletion of working capital to the generation of sales was more in 09-10 compared to 08-09. Working capital turnover ratio is calculated by dividing the cost of sales with net working capital. It shows how many times the working capital (current assets minus current liabilities) is turned over in a year to generate sales. Suppose the working capital is Rs 20,000 and the cost of sales is Rs 1,00,000, the working capital turnover ratio is 5. The aggregated net sales of PSUs rose by 20.9% to Rs 10.08 lakh crore during 08-09, but fell by 5.9% to Rs 9.48 lakh crore in 09-10. However, on the working capital side, their current assets increased by 16.1% to Rs 4.79 lakh crore last financial year after rising by 10.1% to Rs 4.12 lakh crore in 08-09. But current liabilities saw a larger increase by 19.8% last year to Rs 2.65 lakh crore from Rs 2.38 lakh crore (17.2% increase) a year before. This mismatch was a reason for PSUs working capital turnover ratio declining in 09-10. The top five PSUs according to working capital turnover ratio in 09-10 were Petronet LNG, MRPL, HPCL, Scooters India and Indraprastha Gas. A steady rise in the working capital turnover ratio was seen in MMTC, GAIL(I), Tide Water Oil, Hind Copper, BHEL and EIL. In contrast, a steady fall in the working capital turnover ratio was seen with 17 PSUs, including PTC India, Container Corporation, SAIL, BEL, SCI, BEML, Dredging Corpn., MOIL and NMDC. The working capital turnover ratio of SAIL steadily fell from 2.46 in 08-09 and to 1.85 in 09-10. 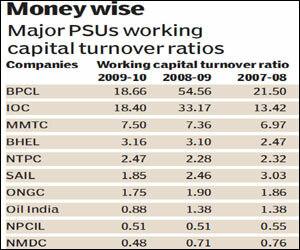 Out of 57 PSUs, only ten had a working capital turnover ratio below 1. They areCIL, NMDC, Nuclear Power, MOIL and Dredging Corporation.